Back in June, Samsung announced a slew of Android KitKat based smartphones including the Galaxy Core 2. While the official launch of the device for the Indian market is still pending, the official Samsung India eStore has already listed the same for a price of Rs 11,900. If you are interested in buying the Galaxy Core 2, here we come up with a quick review of the handset for you to decide. The camera unit at the back of the Galaxy Core 2 is a 5 MP one that is coupled with auto focus and LED flash for enhanced low light performance. This standard camera is accompanied further with a VGA front-facing snapper that can make basic video calls. These camera capabilities are definitely standard for the pricing and we cannot expect anything more advanced from the handset. The storage department is take care of by 4 GB of internal storage space that is too low to store all the necessary content including the operating system, default software and installed applications. Thereby, to help the users there is a micro SD card slot that can support expandable memory cards up to 64 GB providing the users the freedom of storing any content without any trouble of limited storage. The processor employed in the Galaxy Core 2 is a 1.2 GHz quad-core unit of unspecified chipset that should be capable of delivering an average performance and user experience. This processor gets teamed up with 768 MB of RAM for multi-tasking and switching between applications. Considering this hardware combination, we cannot expect superior performance from the Samsung phone. The battery unit inside the Samsung offering is a 2,000 mAh one that is acceptable as it can deliver a decent backup to the device given its mediocre specifications. The Galaxy Core 2 uses a 4.5 inch TFT panel that boasts a WVGA screen resolution of 480×800 pixels translating to a pixel density of 207 pixels per inch. Again, the device joins the already crowded budget smartphone market and hence we cannot expect it to boast superior screen resolution. But, similarly priced handsets launched by the several other do arrive with better screens packing HD resolution and Corning Gorilla Glass coating for scratch resistance. The handset is fueled by Android 4.4 KitKat operating system out-of-the-box and it is packed with the standard connectivity options including dual-SIM card slots, 3G support, Wi-Fi, and Bluetooth. From the specifications and features, it can be said that the Galaxy Core 2 can compete with the likes of Moto G, Xolo Q600s, Zenfone 4.5 and Nokia Lumia 630. 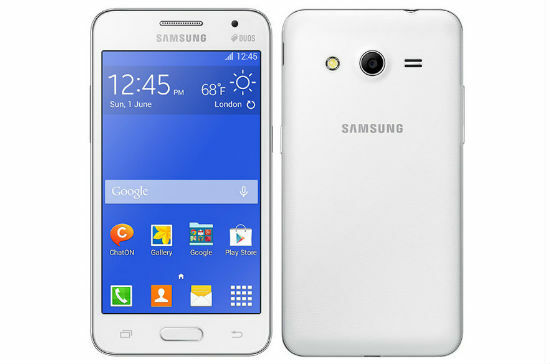 The Samsung Galaxy Core 2 seems expensive for Rs 11,900. In the recent days the low cost smartphone arena has taken many twists and turns and there are many offerings from both local and global players that pack in impressive and capable specifications for lesser price tags. We doubt if the Galaxy Core 2 can really come across as the first option when there are many hot favorites at lesser pricing. Anyways, coming from Samsung’s stable the handset can manage to lure in the loyal Samsung fans looking for reasonably priced devices.